Hey lovely friends. I'm back from my Christmas holiday, feeling refreshed and ready to start the new year. I deliberately didn't take my laptop with me so it would be a real break. However, I did take our iPad so I could review some ebooks I've been dying to sink my teeth into. 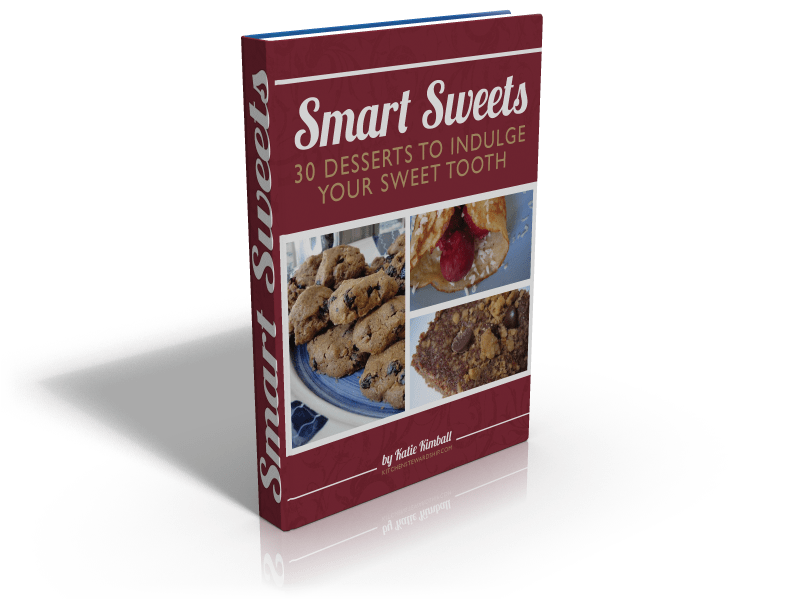 Smart Sweets is one of those ebooks, recently published by Katie Kimball of Kitchen Stewardship. Honestly, I don't know where Katie finds the time. This is her fourth ebook, and she published it mere weeks after giving birth to her third child. In it, she features 30 healthier-than-normal-but-still-delicious sweet treat recipes. Since my strict no-sugar regime went out the window by about the second week of my holiday, I decided to try one of the recipes from Smart Sweets. I chose Peanut Butter Kisses since it didn't require any fancy equipment or ingredients, and only took a few minutes to make. The feedback I got was really positive. My brother-in-law, Mark, said the Peanut Butter Kisses were the best truffles he's ever eaten. High praise. Katie's recipe doesn't include cocoa, but I'm a chocolate lover at heart so added it in. I really loved how easy it was to throw this no-bake recipe together, and ended up making it a second time on holiday. I also think it will be a great one to make with Lily when she wants to bake with me. The other recipes that have taken my fancy from Smart Sweets are Peppermint Coconut Bark, Soaked Fudgy Brownies, Cider Doughnut Spiced Cupcakes, Magic Coconut Pie and Bunuelos. I can't wait to give these a go now that I'm back home in my own kitchen. Good news! Katie is offering Craving Fresh readers a 25% discount on Smart Sweets for two weeks! Just enter the discount code Fresh25 at the checkout before Monday 30 January 2011 to claim your discount. Even better news! Katie is giving away a copy of Smart Sweets to one Craving Fresh reader. The competition opens now and closes at 8am NZ time on Monday Friday 23 January 2011, when a winner will be drawn at random. 1. For one mandatory entry, check out the Smart Sweets table of contents and comment below telling me which recipe you would most like to try. 2. For a second, additional entry, share the link to this giveaway on Facebook, Twitter or another social media sight and leave a second separate comment below telling me where you've shared the link. If, for some reason, you can't comment below, head over to my Craving Fresh Facebook page and make your comment/s there instead. Just be sure to tell me you're commenting to enter the giveaway. I've deliberately left a week's gap between when the giveaway closes and the discount period ends, so that you've got time to buy a copy of the ebook if you're not the lucky winner. However, if you just can't wait to buy Smart Sweets, there's no reason to delay. If you buy a copy now and then win the giveaway draw on Friday, Katie will give you a full refund and probably even throw in another of her ebooks for free. Linked to Monday Mania on The Healthy Home Economist and The Patchwork Living Blogging Bee at Frugal Kiwi. yum yum!! but the peanut butter kisses you made look scrummy!! Mmmm - would have to try the dark chocolate truffles!! Coconutty cake looks good, but would like to try a few of the others as well. The magic coconut pie !!! I shared the giveaway on my facebook ! I am VERY interested in low/no sugar desserts. I have remade all the ones I make for myself to eliminate added sugars, syrups and sweeteners (using applesauce, dates or prune puree instead). The recipe I'd most like to try is fudgy brownies or carrot zucchini cake (although my hubby will likely push for a frozen dessert like the fudge bars or my homemade ice cream with the better-for-you chocolate syrup). I shared on Facebook... my blog page AND my personal page! I shared the link on Twitter! I want to try the black bean brownies. I love the sound of Kelly's probiotic fudge bars. Those truffles you made Emma look so yummy. I think I would love to try the Whole Wheat Carrot Zuchini cake.